NASA images by Jesse Allen, based on data provided by Robert O’Malley, Oregon State University. Every day, more than 100 million tons of carbon dioxide are drawn from the atmosphere into the ocean by billions of microscopic ocean plants called phytoplankton during photosynthesis. In addition to playing a big role in removing greenhouses gases from the atmosphere, phytoplankton are the foundation of the ocean food chain. For nearly a decade, the Sea-viewing Wide Field-of-View Sensor (SeaWiFS) has been making global observations of phytoplankton productivity. 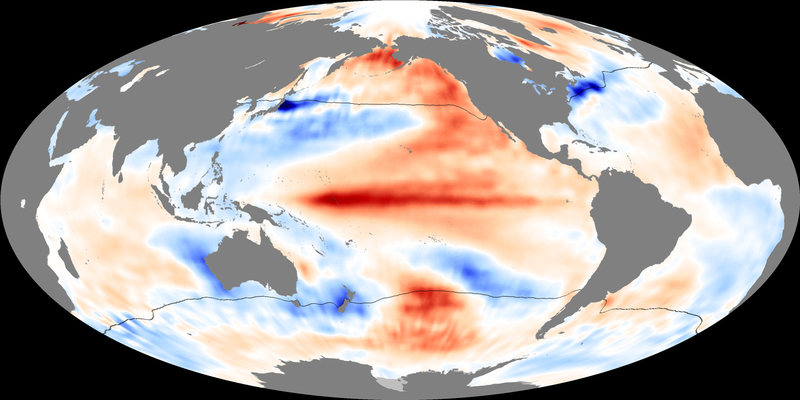 On December 6, 2006, NASA-funded scientists announced that warming sea surface temperatures over the past decade have caused a global decline in phytoplankton productivity. This pair of images shows changes in sea surface temperature (top) and phytoplankton productivity (bottom) between 2000 and 2004, after the last strong El Niño event, which occurred between 1997-1998. Places where temperatures rose between 2000 and 2004 (red areas, top image) are the same places where productivity dropped (red areas, bottom image). In general, the reverse situation was also true: where temperatures cooled, productivity rose. The sea surface temperature map is based on data collected by the Advanced Very High Resolution Radiometer (AVHRR) sensors onboard several National Oceanic and Atmosphere Administration satellites. Why do warmer temperatures have a negative influence on phytoplankton growth? The most likely explanation is that the warmer the surface waters become, the less mixing there is between those waters and deeper, more nutrient-rich water. As nutrients become scarce at the surface, where phytoplankton grow, productivity declines. The effect is most obvious in the part of the world’s oceans that scientists describe as the permanently stratified ocean, bounded by black lines in the images. “Permanently stratified” means that rather than being well-mixed, there is already a distinct difference in the density of warmer, fresher water at the surface and colder, saltier water deeper down. Seasonal stratification occurs in other parts of the ocean, but in the labeled area, the stratification exists year-round. In this situation, with “lighter” (i.e., less dense) water on top, and “heavier” (denser) water below, there is little vertical mixing, and nutrients can’t move to the surface. As surface water warms, the stratification, or layering, becomes even more pronounced, suppressing mixing even further. As a result, nutrient transfer from deeper water to surface waters declines, and so does phytoplankton productivity. Behrenfeld., M., O’Malley, R., Siegel, D., McClain, C., Sarmiento, J., Feldman, G., Milligan, A., Falkowski, P., Letelier, R., and Boss, E. (2006). Climate-driven trends in contemporary ocean productivity. Nature, 444, 752-755.